Hi, I’m Rachel, the editor of FWIW. Starting this week, the ACRONYM team will be reviewing the campaigns through the lenses of the people those campaigns are trying to reach – the supporters, the donors, and the organizers. What happens when people actually engage with the 2020 campaigns? And how do (or don’t) those campaigns engage back? And make sure you get to the end – because we’ve got a theory on what may have been behind the Elizabeth Warren/Facebook ad controversy earlier this week 🧐. The Google spending report has finally been updated! 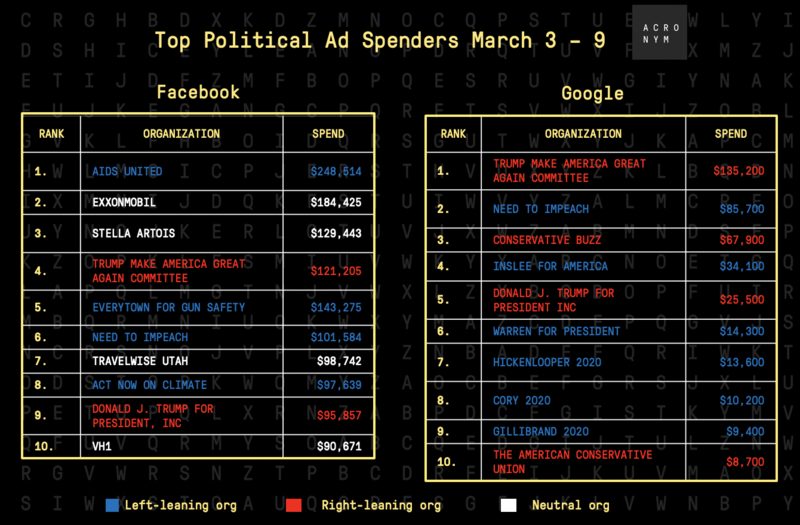 So here are the top spenders on Facebook and Google for the past week. There are a few notable spenders on both these lists. 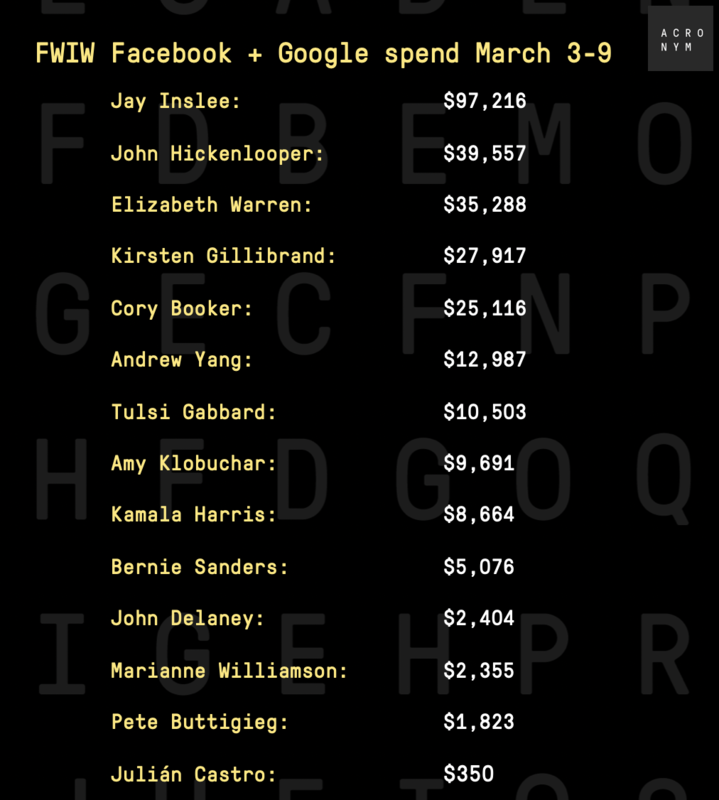 For one, the super PAC backing Jay Inslee spent over $97K on Facebook ads last week. 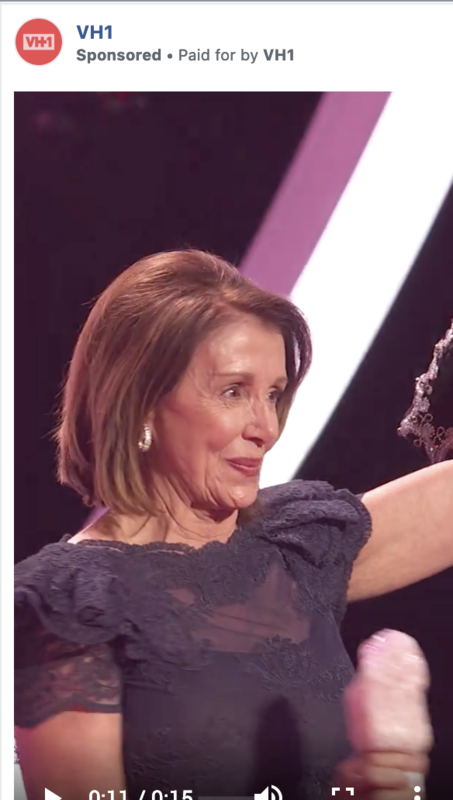 And VH1 spent just a little bit less than that promoting the VH1 Trailblazer Honors last week, celebrating women in politics and entertainment, including Alyssa Milano, Mindy Kaling and Nancy Pelosi (yep that’s an ice cream cone). 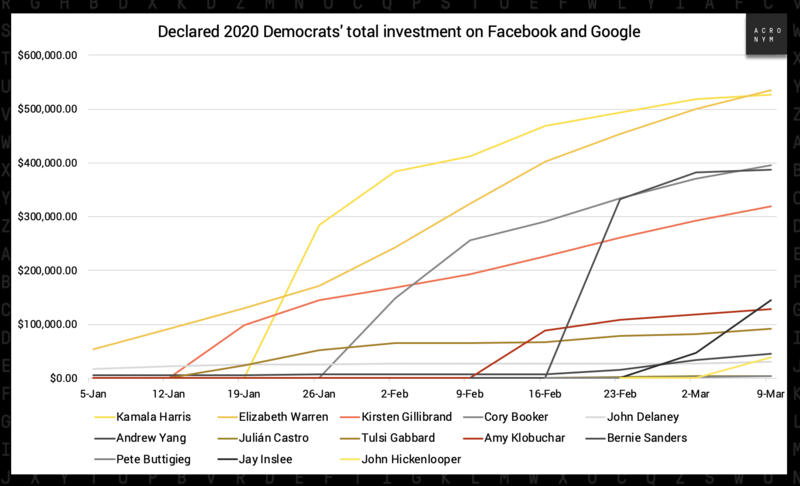 Speaking of Jay Inslee, his campaign topped the list of 2020 Democratic candidates’ investment online. His campaign spent an eerily similar amount on Facebook and Google ($97,216) as the Super PAC supporting him ($97,639) 🤔. 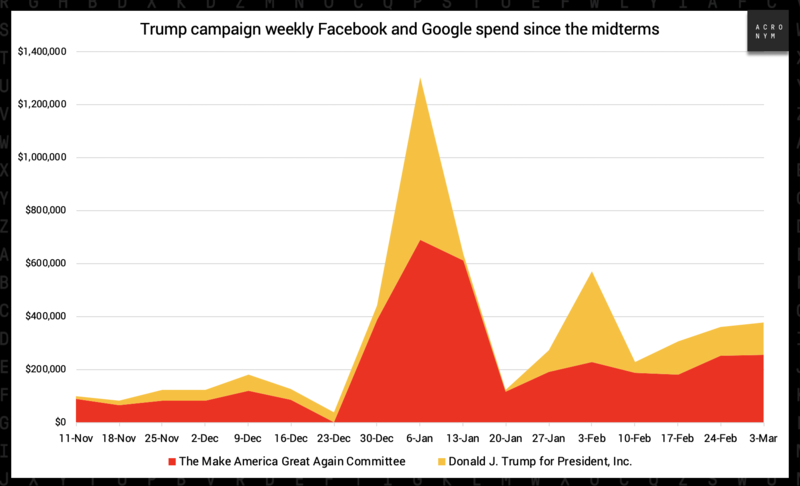 On the Republican side, Trump spent over $377K on Facebook and Google last week, totaling his online investment since the midterms to nearly $5.4 million (this includes updated Google numbers from previous weeks). A huge focus has been put on small dollar donors this cycle (rightly so). 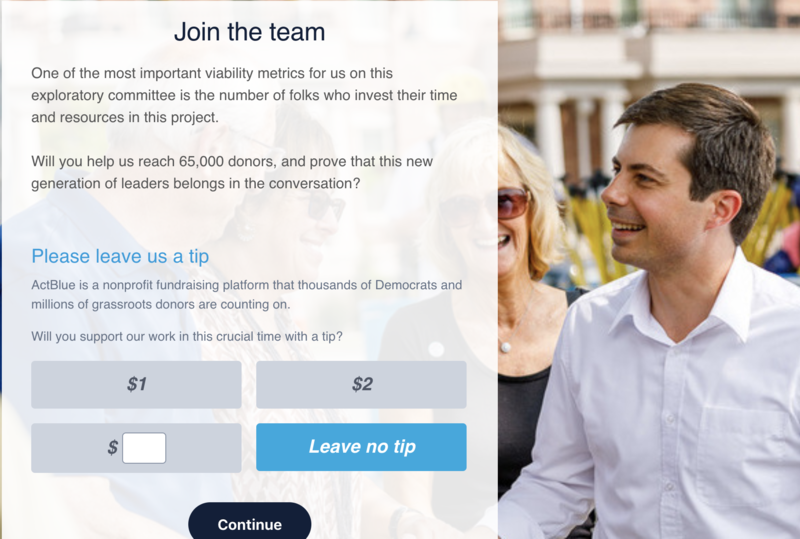 At ACRONYM, we care not only about how campaigns are bringing those donors in, but also what they ask of their early supporters in order to make that first donation and then how they continue to keep those supporters engaged with the campaign thereafter. Spoiler alert: most of the candidates make the exact same asks of their supporters when supporters go to donate. 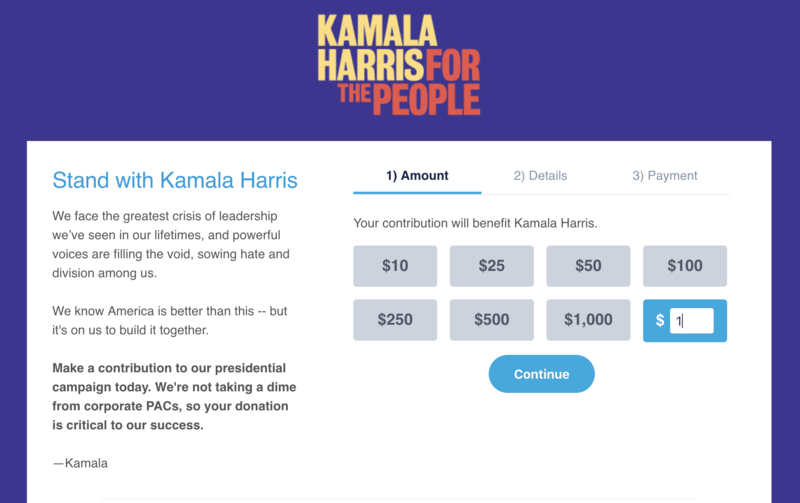 That’s because all of the Democratic candidates running for president today use the same donation platform to process small-dollar donations: ActBlue. 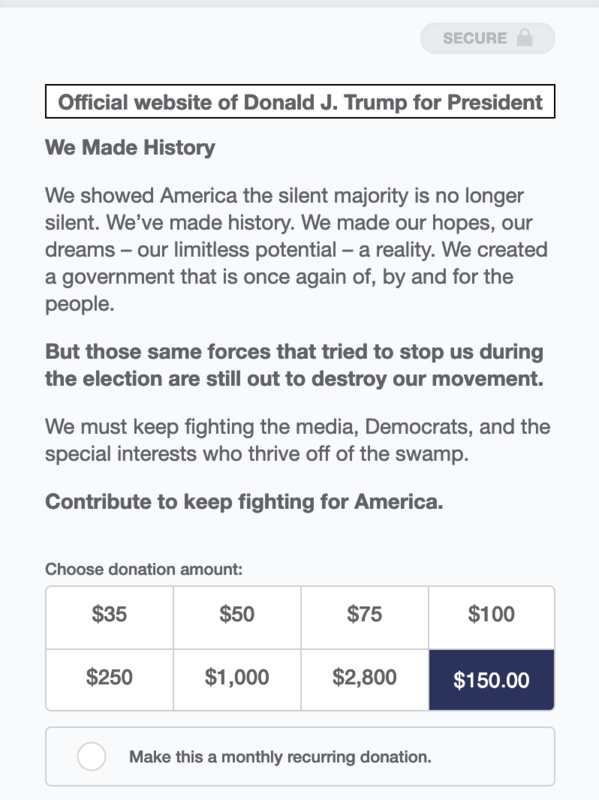 When you click the “donate” button from a campaign’s homepage, you’re sent to the payment processing platform – for Democrats this is ActBlue, for Trump, this is Revv. They all look pretty much the same, with a short paragraph highlighting the candidate’s main campaign message next to a number of options of contribution levels. The benefits that Democrats have in all of them using the same platform is that when you contribute once, ActBlue saves your information, making it easier to donate to other Democratic candidates in the future. You’re then asked to make your donation a monthly recurring donation. 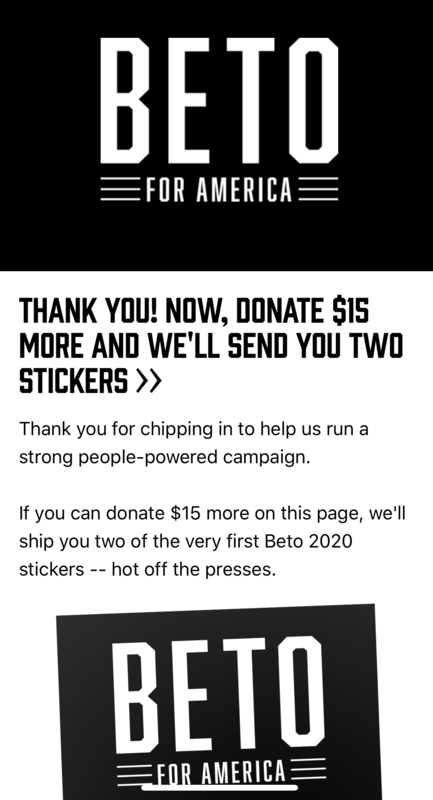 ActBlue asks you to leave them a tip. 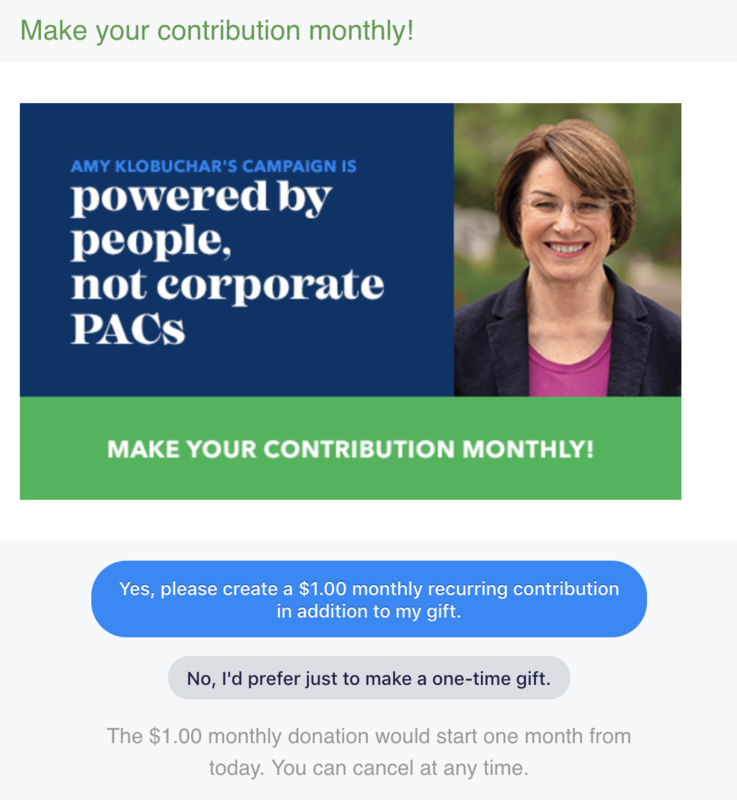 What many small dollar donors don’t know is that campaigns that use ActBlue are already paying the organization a percentage of their total dollars raised on the platform, but that’s for another FWIW. Now share on social! Most campaigns send you to a page that prompts you to post on Twitter, Facebook or email your networks about the contribution, but some automatically redirect you to their campaign website. For the campaigns that choose to immediately redirect you to their website, we think they could be losing an opportunity to reach a greater number of potential supporters since those donors are never asked to share that they donated to the campaign to their own channels. There were a few exceptions I found to the process described above. His site makes it much harder to figure out how to contribute a different amount than the one suggested. 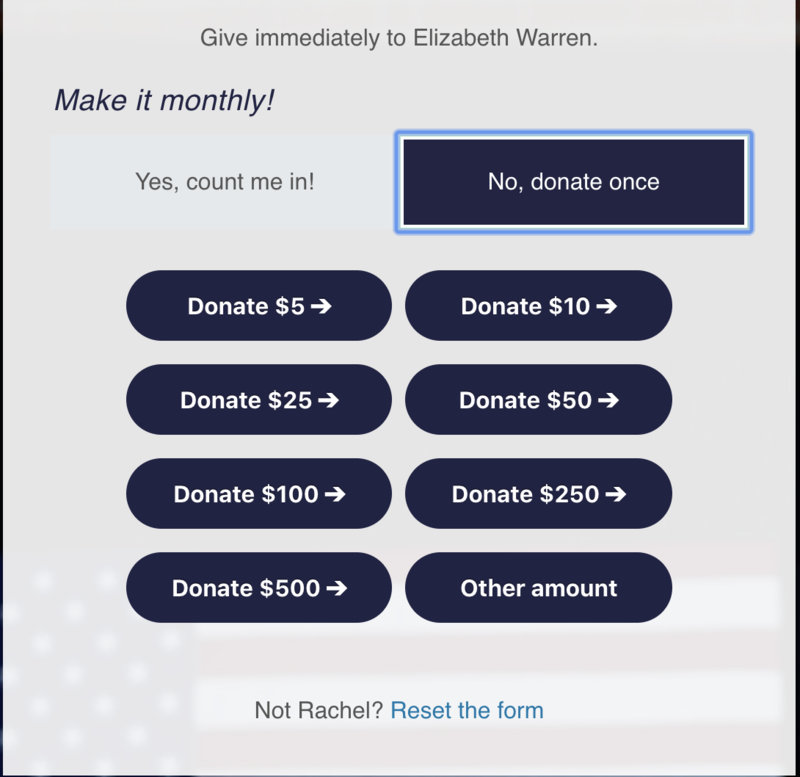 Unlike ActBlue, which offers a “donate a different amount” button to choose your own contribution level, you have to click on the $150 option to enable the site to bring up a box where you can fill the amount in yourself. 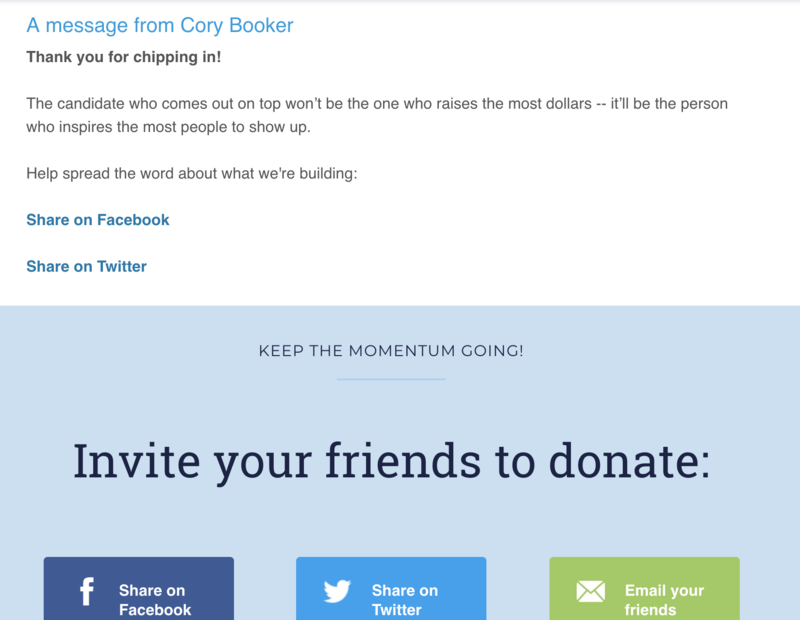 For the candidates who did prompt donors to “invite your friends to donate” online, we were disappointed in the lack of creativity around the messaging in the prepared social copy. Rather than using prompts that convey how a supporter is now part of something bigger than themselves, the copy was pretty generic. 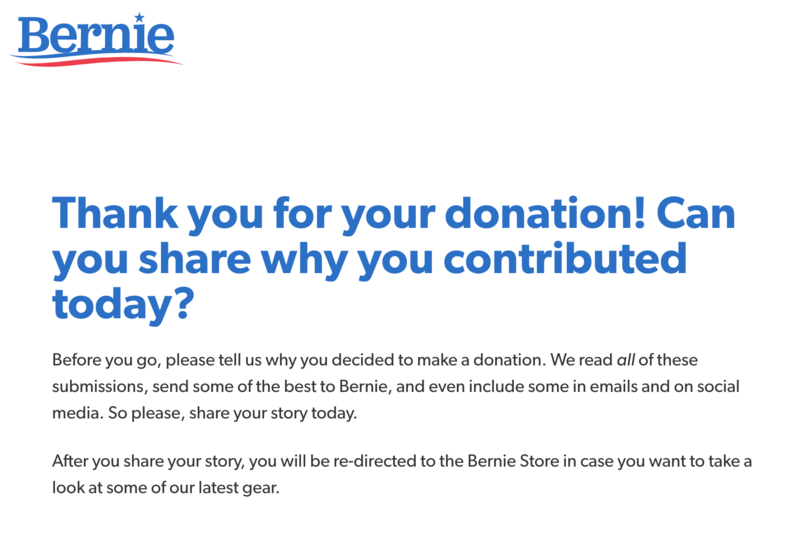 We did notice, though that both Bernie Sanders’ campaign and Kirsten Gillibrand’s campaign both prompted users to share with the campaign why they donated – and that content could be powerful to use not only to inform strategy, but also to develop more personal social content for the campaign to use to engage more voters. 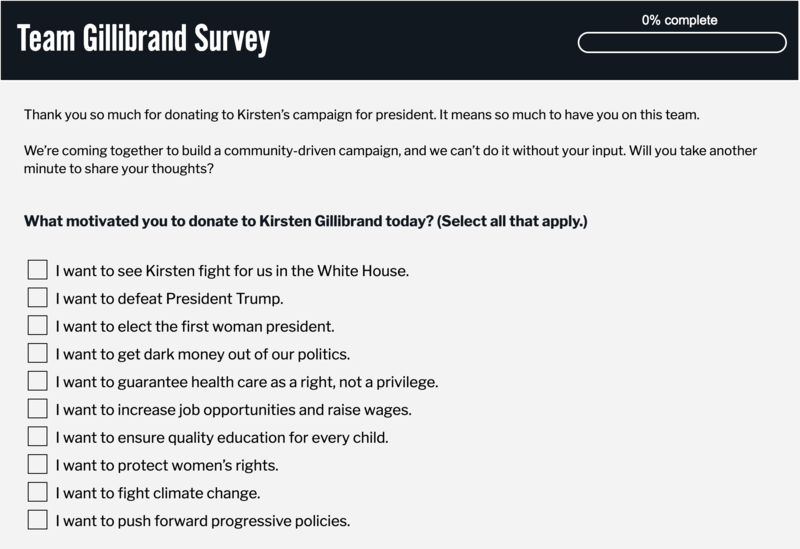 Gillibrand’s campaign even had a 4-page survey that it brought donors through. All in all, the differences between what the candidates asked of donors didn’t vary that much. But in such a crowded field, it could be the small differences – like sending donors to a merch store or asking them to give feedback on why they donated – that could give one candidate an edge over another. I’m sure by now you’ve heard the news about Facebook taking down Elizabeth Warren’s ads about breaking up tech companies, then reposting them after a media frenzy ensued..but was it all planned? For anyone who has run digital advertising campaigns in recent years – especially anyone who ran ads in 2016 – it’s highly likely they knew that the ads would be immediately pulled down by Facebook. Why? The use of any logos of the Facebook family (Facebook, Instagram and WhatsApp) are highly restricted, and operatives who place Facebook ads are made aware of that. What do we mean by “restricted?” Facebook’s logos can only be used in specific circumstances – in the frame of “find us” or “like us on Facebook”. 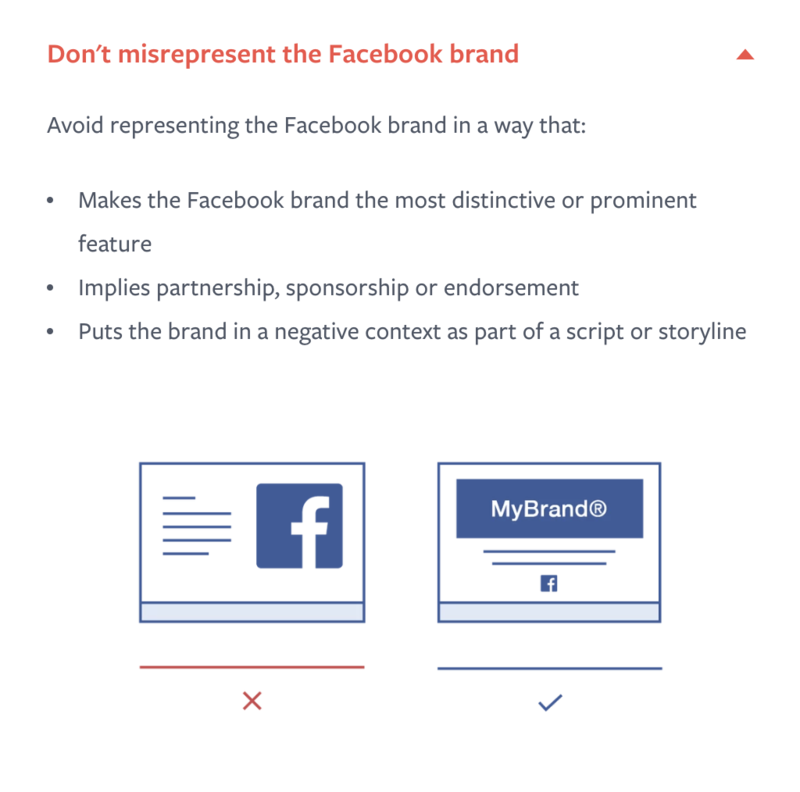 All other uses of the logo which don’t fall into the categories described in the guidelines need to be approved as exceptions by Facebook. 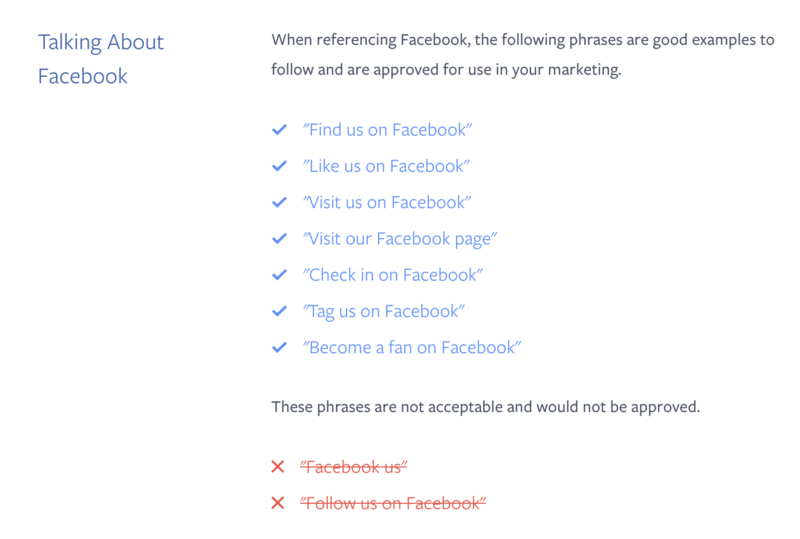 Before August 2016, you couldn’t use the Facebook family logos at all in Facebook ads. It’s likely that the person placing the ads knew that the ad would immediately get pulled down – and Politico reported that only a few hundred dollars were put behind the initial buy featuring the logo, which isn’t much at all (some may call it a “vanity buy”). 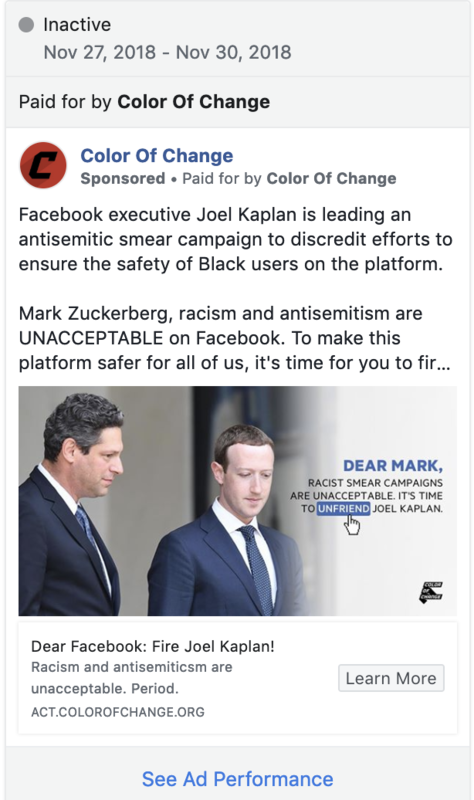 If a campaign really wanted to convey their message without the ads getting pulled down, they’d know not to use the logo in an editorial context that’s negative towards Facebook. 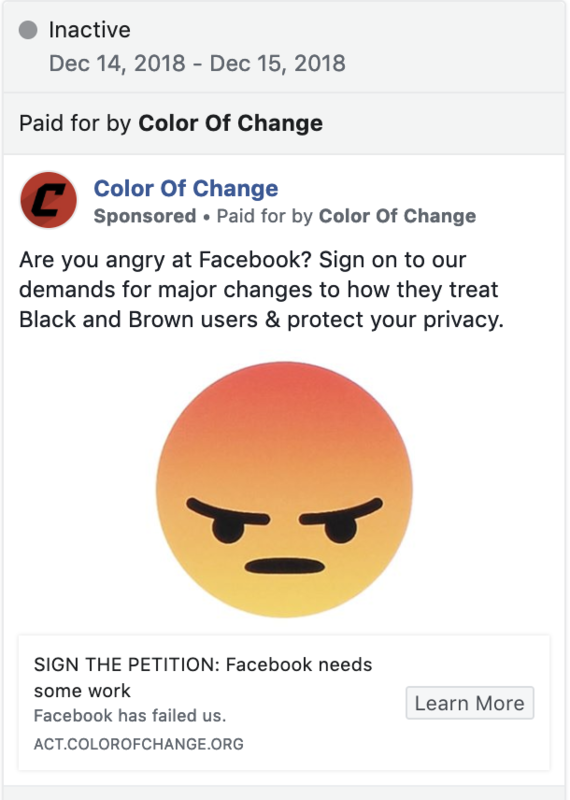 After all, organizations like Color of Change were running anti-Facebook ads as far back as November of last year – and the few that got removed were the ones that included the logo. That’s all for this week. I’ll be posting some more interesting anecdotes and screenshots from what I found donating to each candidate in the race, so be sure to follow along on Twitter. Thanks for reading – as always feel free to email us with ideas of what you’d like us to dive into next, and share the FWIW sign up link with friends and colleagues. P.S. You can find today’s issue of FWIW here and read this week’s issue of FWIW Virginia at this link.